Workers’ compensation is an insurance coverage that protects businesses by providing wage replacement, medical expenses and rehabilitation costs to employees who suffer job-related injuries and illnesses. The coverage can also protect employers from lawsuits filed by injured workers, and, if a worst-case scenario plays out, can provide death benefits to cover funeral expenses and to support a worker’s dependents. According to Gregory P Guyton, author of ‘A Brief History of Workers’ Compensation,’ the concept of providing compensation for bodily injury began “shortly after the advent of written history itself” in ancient Sumeria (present-day Iraq). In its earliest form, workers’ compensation was based mainly around “impairment,” meaning injured workers received monetary compensation for the loss of function of a body part. Early compensation schemes consisted of “schedules” determining the value of the injuries. For example, the loss of a thumb was worth half the value of a finger. Another important phase in the history of workers’ compensation was the Industrial Revolution across Europe and America. Working conditions in 18th century factories were pretty appalling (and that’s being generous) and injury rates were extremely high. Injured workers rarely received compensation, but they could file lawsuits. The courts were extremely biased towards the employers during this period in history and it was very difficult for workers to gain any monetary reward. Small business insurance specialist Insureon describes the journey of workers’ compensation insurance to the US as a “trickle”. The firm notes: “It took Upton Sinclair’s shocking 1906 novel The Jungle, which details the horrors workers experienced in Chicago slaughterhouses, to stir the public’s outrage,” and persuade Congress to pass the Employers’ Liability Acts of 1906 and 1908. The first state to successfully pass a comprehensive workers’ compensation law was Wisconsin in 1911. This followed a number of failed attempts between 1898 and 1909 by New York, Massachusetts and Montana. The early laws obliged employers to medical and wage replacement benefits and upon acceptance, the injured worker would lose their right to sue the employer. Fast-forward more than a century and workers’ compensation has made its way into every US state in some shape or form. The challenge for employers with today’s workers’ compensation systems are determined by each individual state – and no two states have the same laws and regulations. Requirements under workers’ compensation law vary by state, by industry, and by the size and structure of a business and its payroll. The penalties for breaching workers’ compensation laws can be severe, and, in some cases, considered criminal offences. Insurance rates are also under the control of each individual state. Businesses with operations across state lines or with remote employees in multiple states are obliged to follow the workers’ compensation rules in each relevant state. This process can often seem complicated and daunting for the business owner, which is where the guidance and support of an insurance broker really comes into play. Brokers who fail to alert business owners about state-by-state law differentiation could be accused of negligence and find themselves at the center of an E&O lawsuit. Getting to grips with the different state requirements is key. Approximately two-thirds of US states require employers to purchase workers’ compensation insurance if they have just one employee. Some states are less stringent, for example Alabama, which requires businesses with five or more employees to carry coverage. New York: All employees (including family members, part- and full-time workers, and leased employees) working at for-profit companies must be covered by workers’ compensation insurance. Most employees working for non-profit companies are also required to have insurance. Coverage is not required for sole proprietors or partners without employees, but many opt to purchase it anyway. California: Everybody working for an employer must carry coverage, including apprentices and employees with oral and written agreements. Executive officers and directors of corporations must be included in the workers’ compensation coverage, unless they fully own the corporation. Texas: Private employers do not have to provide workers’ compensation insurance. However, some companies in sectors like construction or governmental contract entities must have coverage. Employers must report their coverage status and any work-related injuries to the Division of Workers’ Compensation. Insurance brokers, employers and employees can learn about the requirements in each state by visiting the states’ workers compensation department websites. An injured employee can receive benefits under workers’ compensation law regardless of who was at fault in the workplace accident, including the employee, the employer, a coworker, a customer, or another third-party entity. If the injury was suffered while the employee was not on the job. Employers are increasingly aware and engaged with the concept of workplace safety. Many are turning to technology and digital tools to ensure the safety of their workers, to educate their employees and to collect data about every aspect of their business operations. For example, some firms are using virtual reality tools to place employees in dangerous scenarios and coach them about best practice responses. 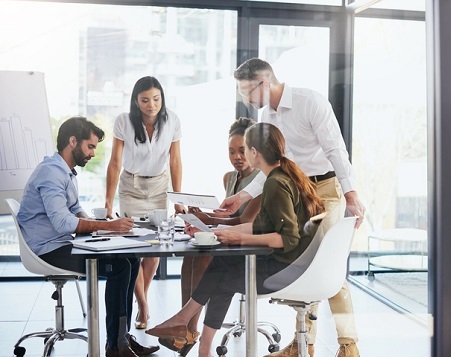 Others are connecting all employees with tracking devices, so they can see where they are at all times and monitor their environment in order to alert them to any potentially harmful situations. As technology continues to evolve, risk mitigation in the workplace will continue to improve and will become ever more important in the insurance landscape – by means of more efficient and accurate underwriting, claims management or even premium discounts.